I started writing about music in 2002, when Tarwater came to town. A gig like many others, but the cunning art of self-admiration, combined with the romantic idea of receiving free albums and press passes kept me going for quite a few years. I have had many a chance to review groundbreaking albums like the Strokes’ Room on Fire, or the Darkness’ late glam masterpiece Permission to Land, and I honestly felt rather embarrassed for those who had to come up with idiotic Pindaric flights to shamelessly tell us that, yes, rock music was reaching a new high. Luckily for me, I never had to review a new Pink Floyd record and I will probably keep myself at a safe distance next time something comes out. But there is nothing to fear with The Division Bell. It is an album that is OK to dislike. When it came out, in 1994, most critics saw it as the elegant, albeit ineluctable evidence of the fact that Pink Floyd’s inspirational juices were all but gone. Those were the so-called (not without a hint of malice) “Gilmour years”, when his guitar, that sliding, that minimalism that ironically made the band’s sound too complete, those blues licks and those minor pentatonic scales were almost all that Pink Floyd was about. But the record sold millions of copies and became the last studio album to be released by the remaining members of the band -- the late Richard Wright, Nick Mason and the aforementioned iconic guitarist. Although not playing an active role in the making of the album, founder Roger Waters is indeed a presence to be reckoned with. 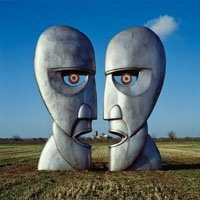 The Division Bell is an album inspired by a mix of angst, resentment and disillusion, most of them aimed at the betrayal of the spirit which pervaded Europe at the end of the previous decade ("A Great Day for Freedom"), but it is undeniable that Waters is somehow at the receiving end of tunes like “What Do You Want from Me” or “Poles Apart”. A lot has been said and indeed will continue to be said about the lasting legacy of Pink Floyd, a band so capable of appealing to the educated ear as well as to the occasional listener. And whilst this box will not contribute any succulent insight to the debate, it undoubtedly provides the perfect soundtrack. The sound, on this Deluxe Collector’s Edition box, has been treated to a 5.1 surround sound mix, remastered from the original analogue masters on a 2-LP 180-gram vinyl featuring full length tracks for the first time. And as if it weren’t enough, the box contains a red seven-inch vinyl replica of "Take It Back”, a clear 7-inch and a 12-inch vinyl replica of "High Hopes" with reverse laser etched design, the 2011 Discovery remaster of The Division Bell, and a Blu-ray disc including the album in HD Audio and a new music video for the Grammy-winning track "Marooned". You know. The usual. Is this box worth the money it is on sale for ($125.88 on Amazon)? With a Pink Floyd album, this is a matter of subjectivity. The average buyer knows exactly what they’re getting, so no word of advice is needed or, indeed, sought. The Division Bell is what it is: not the best Pink Floyd album and, yet, a sonic masterpiece.